Very nice and durable! Love the fact you can adjust it to your wrist size. It goes perfectly with either a stainless steel watch or a brown. I really recommend it! 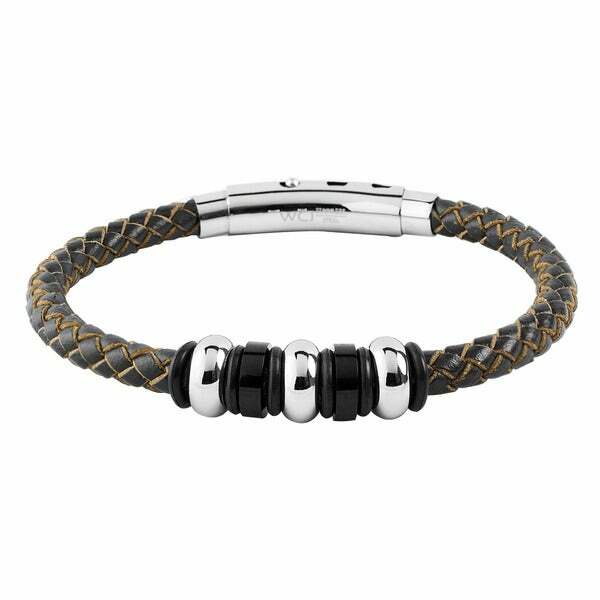 This eye-catching men's bracelet showcases a briaded brown leather that contrasts with stainless steel beads. The bracelet snaps comfortably around your wrist with a push-button clasp.The bracelet measures 10.6 mm wide x 8.5 inches long x 5.4 mm thick. The weight of the bracelet is 15.2 grams. The bracelet encloses with a push-button clasp. Bracelet is well made and appears as pictured. Fits me well needed a 7 1/2 inch. Comfortable, well made! I wear it almost everyday. Goes well with what I wear from shorts to jeans to suits. This being my 1st order with Overstock I was surprised at how fast shipping time was. Sturdy, good construction, firm lock! Did not like this product.